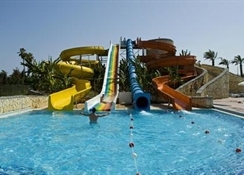 This large resort complex is built on 230,000 m2 of land and consists of a club section with a variety of room types in 2-storey blocks, the main hotel building and a new section of deluxe rooms which is connected to the main building. With a total of 651 guest rooms on offer, there is a rich variety of facilities and amenities with shops, a hotel safe, currency exchange facilities, lift access, a newspaper stand, a hairdressing salon, an auditorium and a TV lounge. 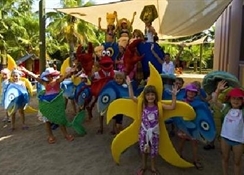 Younger guests will be entertained at the playground and kids' club. Renovated in 2009, the air-conditioned establishment welcomes guests in a lobby with 24-hour reception and check-out service. There is a restaurant in both the club and hotel sections of the resort as well as speciality restaurants, a cafÃ© and a choice of bars. Business guests are sure to appreciate the conference facilities. For additional fees guests may make use of the room and laundry services and bicycle hire. Internet access and a car park round off the facilities provided. LocationThe complex is located in the Sorgun/Titreyen area of Side, close to a pine forest and situated on a long, sandy beach. Links to the public transport network are in front of the hotel. Antalya Airport is 65 km from the hotel. RoomsThe pleasantly furnished standard rooms in the main building are fitted with laminated flooring, centrally controlled air conditioning, a bathtub, satellite TV, minibar (daily refilled with water and soft drinks) and Internet access. Club rooms have a shower and a balcony or terrace and no Internet access. All rooms are en suite and equipped with a hairdryer, double bed, direct dial telephone, radio and safe. The heating is centrally regulated. SportThe hotel has 2 outdoor swimming pools as well as an indoor heated pool, water slides, a children's swimming area and a spa centre (extra charge) with a sauna, Turkish bath, hot tub, massage and special treatments and also a gym. Refreshments are served at the poolside snack bar. Sun loungers and parasols are laid out on the sun terrace and the sandy beach for use. Entertainment for adults and children includes daytime activities, live music and evening shows organised on a regular basis, and on the beach there are a number of water sports available for an extra fee. These include jet skiing, diving, surfing and banana boating. Waterskiing, catamaran boating, canoeing and pedal boating are also possible. Guests may partake in aqua fit and aerobics session, or enjoy a range of other activities such as tennis, table tennis, pool/snooker and darts. Furthermore, basketball, volleyball, beach volleyball, bocce, minigolf and archery are available. Horse riding incurs a fee. The golf course in Belek is around 40 km away. MealsAll meals are served in a buffet form with drinks included. Special theme nights are organised and there is a late breakfast option. Dinners may alternatively be selected Ã la carte. PaymentMasterCard and VISA are accepted as methods of payment.